Our second destination for restaurant week was the Rose Veranda at Shangri-La Hotel. We had previously talked about coming here because of their 128 premium twg blends, but didn’t do so because of the price. Now with restaurant week, and sans the dining star, we were more than happy to pay $25++. The setting was idyllic- long glass windows facing lush greenery and a pool. 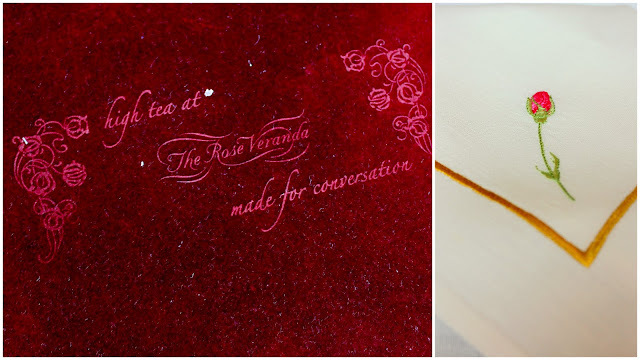 Loved the exquisite embroidery on every napkin, and the rose themed teacups, teapots, and plates. Every person is entitled to order 1 type of tea, and this is free-flow. I’m glad the waitresses weren’t very sticky about not sharing our pots of tea. We ordered 8 different blends, and took sips from each other’s cups. I got the Snow of Fujian, while the friends had Fruit mountain, First Kiss, Geisha Bloom, Smoky Earl Grey, Summer Palace, Vanilla Bourbon, and Pink Flamingo. Inundated with choices, most of the friends selected their tea based on their names at the end. It was quite amusing to say the least. Snow of Fujian tea falls under the green tea category. It’s understated, subtle, and light. If you prefer stronger, more aromatic teas perhaps the Smoky Earl Grey would suit you better. Geisha bloom smelt an awful lot like the peaches I have at home now, and that was another hot favourite around the table. If you are absolutely in love with pink, you might want to try the pink flamingo tea. Suffice to say the friend was overjoyed the instant they poured it out into her teacup. Perhaps we should gone with the blue tea to see if it really turned out blue. If you have the guts, try the chocolate tea and tell me how it went! The selection isn’t as extensive as the teas, but we nonetheless found things we liked, and indulged in multiple servings of our favourites. Salmon is one of my favourite types of fish because of it’s distinctive flavour. I had it raw in the form of sushi, smoked, and cooked. My favourite goes to the cooked one, which despite being cooked to the middle, didn’t come across as dry. I suspect it was the apricot glaze that really got me hooked, aside from the extra savoury punch from the squirt of cream cheese, and caviar. Yum. There’s a huge selection of leaves there, and condiments to go with it. This was a hit amongst the friends, who went for seconds and thirds even. I’ll never understand salad with only raw leaves- it’s beyond comprehension. They have quite a decent selection of hot dishes, at least 10. But for myself i was attracted to none of them (mainly because the dessert bar was lingering at the back of my mind), aside from the charsiew baos in the limited dim sum selection they have. Looking back this looks like the one I had at Shang Palace (just downstairs) previously. Soft fluffy bao encasing sticky sweet shreds of lean meat with not a chunk of fat in sight. No fillers whatsoever here either. And now for desserts! The selection is quite commendable. There are those in shot glasses (tiramisu, rice pudding) or those in ramekins (bread and butter pudding with vanilla sauce, and creme brulee). Cakes were sliced into bite-sized pieces for easy eating. They have asian desserts as well like fried sesame balls filled with red bean and an assortment of nyonya kuehs. 2 types of ice creams were offered, Chocolate and Raspberry. I’m sure the kids won’t miss the chocolate fondue at the centre! The passionfruit layer cake which was also the cake of the month, was light and pleasantly tart. The pecan pie is a must-try. While the buttery crust was all right but not mind-blowing, I loved the soft filling which wasn’t overcrowded with pecans, and the pecans caramelised on top that had a sweet-savoury flavour that really grew on me! But word of caution, a slice does fill you up. These mini buttery warm scones are not to be missed either. It passed my test for having a thin shortbread-like crust, and soft fluffy insides. Clotted cream, and jam are provided but I preferred to enjoy them just like that with the tea. The truffles were so darn addictive. The friend and I couldn’t stop popping them into our mouths- this matcha white chocolate one in particular. Little explosions of smooth creamy chocolate every single time. To end it all, we were served earl grey sorbet. Look at all the tea! The experience was a memorable one- largely due to the company and the endless streams of conversations. Contrary to all the bad reviews online, we really enjoyed ourselves. We stepped out bright-eyed, and bushy-tailed, ready for everything that is to come.